In December 1984, after the reactivation of the Nevado del Ruiz Volcano, the Colombian Geological Survey (SGC) began campaigning for the deliver of volcanic risk information. The campaigns, focused mostly on communities located in high volcanic hazard zones, received expert advice and support from national and international volcanologists. Within the context of contrasting, multicultural and multi-ethnic features in Colombia, community reactions to the campaigns have ranged from immediate acceptance of risk, to outright denial and rejection of risk awareness. Religious, political, and philosophical arguments underlie the range of reactions seen in targeted communities. Since December 1984, volcano monitoring has also increased throughout the country. As part of the monitoring strategy, volcanologists have worked on assuring continuous transmission and open access of data to the general public, especially during times of increased volcanic activity. 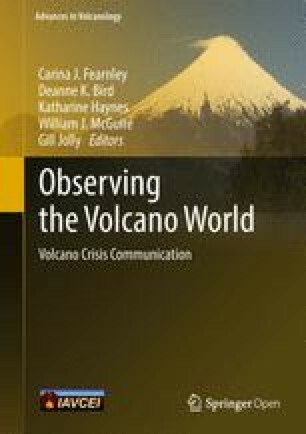 This chapter contains an empirically–based discussion of the measures undertaken by technical volcanologists in Colombia to address volcanic hazard communication for communities located in the hazard zones of Nevado del Ruiz, Nevado del Huila, and the Volcanic Complex Cumbal and Cerro Machin volcanoes. This account is coupled with a review of campaigns described in articles and official reports by the entities in charge of the communication process. The chapter shows how most campaigns focused on delivering technical information to the public. A few cases included inter-agency risk communication campaigns involving social science and participatory activities, within interdisciplinary and participatory educational projects. Further research is necessary in order to analyse the impact of the different communication processes in Colombia. This could provide important feedback to the Colombian volcanological community about how to achieve more effective risk communication campaigns that increase the levels of risk perception and awareness of communities at risk. Tell me and I will forget. Show me and I will remember. Involve me and I will understand. Step back and I will act. Risk communication aims to increase awareness by encouraging people to adopt preparedness measures that reduce their risk and increase their ability to manage hazard consequences and to make informed and appropriate independent judgments to minimise loss of life and damage to property (Rodriguez et al. 2004; Paton et al. 2008; Haynes et al. 2008). However, providing information about risk is simply not enough, since it is not information by itself that determines whether people act to manage their risk (Paton et al. 2008; Perry and Lindell 2008; Garcia and Fearnley 2012). Rather, decisions to act are determined by how people interpret information in the dynamic context of previous experiences, social relationships, trust and expectations (Perry and Lindell 2008; Haynes et al. 2008). This is especially true when people at risk are in denial about the risk they face or when they expect to be protected by the authorities and emergency personnel, being therefore unprepared to respond appropriately and effectively to warnings. Therefore, risk communication campaigns should intend both to educate and to promote risk reduction (Donovan and Oppenheimer 2014). Furthermore, the levels of risk perception and awareness are strongly related to the availability, quality and quantity of information, which should be provided at the proper time and should be adapted to the local conditions (Mileti and Sorenson 1990; De Marchi 2007). In this sense, an effective educational or communication campaign needs not just a far-reaching divulgation, but it is fundamental to provide the information in a clear way, using simple language and terminology. To consider local customs and traditions is essential, as well as the real level of perceived risk and the type of information that the population considers more relevant and necessary to improve preparedness. Several authors agreed that delivering information and disseminating a warning might not be effective at generating an appropriate response unless strongly accompanied by participatory educational campaigns to assure that the warning message is well understood (Paton et al. 2008; IFRC 2009; Bird et al. 2010). Additionally, people are more likely to react appropriately when they have participated in risk education and communication campaigns where there is a process of sharing information among the different stakeholders, among the different actors, a key aspect trust being (Perry and Lindell 2008; Haynes et al. 2008). Some examples, where sustained prior public education and community preparedness resulted in effective reactions, include the eruption of the Mount Pinatubo Volcano in Philippines 1991 (Punongbayan and Newhall 1998); and, Hurricane Michelle in Cuba 2001 (Wisner 2001). In Colombia, before the reactivation and subsequent eruption and lahar of Nevado del Ruiz Volcano (NRV) that destroyed the city of Armero in November 1984, volcanology was limited to local studies, especially of geothermal evaluation. It was not only until such reactivation that the study of volcanic hazard and risk assessment began, followed by the dissemination of the results of such studies. Formal volcanic monitoring started after the NRV eruption in November 1985, with the creation of the network of Volcanic and Seismological Observatories of Colombia, based in Manizales (1986), Pasto (1989) and Popayán (1993), the latter being the only volcanological observatory established in Colombia prior to a crisis situation (Agudelo et al. 2012). Regarding volcanic risk communication activities, the ones developed prior to the 1985 Nevado del Ruiz Volcano (NRV) eruption were the first of their kind in Colombia. Since then, the volcanology community has developed regular communication activities, especially during periods of reactivation of any of the fourteen volcanoes considered active in Colombia (Fig. 1). Most of those activities focused on the provision of risk information by technical volcanologists to local communities and authorities. There are however some cases of multidisciplinary risk communication campaigns. Colombian experiences on volcanic risk communication provide valuable examples of how effective different communicational approaches are, ranging from provision of scientific information to multidisciplinary and participatory communicational campaigns. On the other hand, there has been an evolution in the use of technical terminology in Colombia. For example, Monsalve and Méndez (1995) pointed out that at that time of NVR reactivation in 1984 “hazard maps” were incorrectly called “risk maps” by the volcanological community. In fact, at the beginning of volcanological studies in Colombia the term ‘hazard’ was not used. The first hazard maps were entitled “Preliminary Potential Volcanic Risk Maps”. The term ‘hazard’ was first used when the volcanic hazard map of NRV was updated and published in October 1986 (Parra et al. 1986). The definitions used in that map were: “volcanic risk: expected consequences on lives and goods in case of a potentially destructive volcanic eruption”; “volcanic hazard: potentially destructive volcanic event which can affect a specific area” (Parra et al. 1986, p. 1). Nowadays, volcanic risk definition is still the same, whereas the definition for volcanic hazard is “the probability of occurrence of a potentially damaging volcanic event within a specific period of time in a given area” (INGEOMINAS 2012, p. 1). Regarding the legislative framework, Table 1 contains the first legislative instruments on risk management and volcanic risk in Colombia. After that, the Law 1523 of 2012 provided a breakthrough in the legislative framework of Colombia. This law created the National System for Disaster Risk Management, thus evolving from a Prevention and Attention focus into Disaster Risk Management. The law defined Disaster Risk Management as “a social process with the express purpose of contributing to safety, well-being, people’s quality of life; and to sustainable development, made up of three main components: risk knowledge, risk reduction and disaster management” (Law 1523 of 2012, article 1). Furthermore, Law 1523 states that risk management is “a development policy indispensable to ensure sustainability, territorial security, collective rights and interests, improvements in the quality of life of populations and communities at risk. Therefore, risk management is inherently related to: safe development planning, sustainable territorial environmental management at all levels of government, and effective people’s participation” (Law 1523 of 2012, article 1, paragraph 1). Besides the above-mentioned laws, the Constitution of Colombia of 1991, has two important articles related to participation and risk management. Article 2 states that some essential purposes of the State include: “to facilitate the participation of all citizens in the decisions that affect them”. It further specifies that: “the authorities of the Republic are instituted to protect everyone residing in Colombia: in their life, honour, property, beliefs and other rights and freedoms.” In addition, Articles 16, 18, 20 and 28 of the Constitution are related to the right to free development of personality, freedom of conscience, freedom of expression and to the transmission and reception of truthful and impartial information. This chapter provides an account of four experiences on volcanic risk communication in Colombia, including the campaigns prior to the 1985 eruption of Nevado del Ruiz Volcano (NRV), followed by the attempts to address volcanic hazards communication in the Nevado del Huila volcano, in the Volcanic Complex Cumbal and in the Cerro Machín volcano. In each of the four cases, a description of the reaction by the local communities is discussed. The data presented in this chapter is drawn from archival data, accounts given by the local communities, and the personal experience of the authors via participant observation and engagement. In Colombia, volcanic risk communication activities developed by technical volcanology began prior to the 1985 eruption of Nevado del Ruiz Volcano (NRV). Since then, regular activities for the dissemination of volcanic risk information have been developed, including those describe in the following sections. After decades of inactivity, reactivation of NVR occurred in 1984, characterized by small fumaroles and earthquakes that generated concern among the population and authorities in the State of Caldas. According to INGEOMINAS (2006) (National Institute of Mining and Geological Research—nowadays Colombian Geological Survey—SGC), following such reactivation, in January 1985 a new regional body was created and called the Comité de Estudios Vulcanológicos de la Comunidad Caldense (Committee of Volcanological Studies for the Caldas Community). This Regional Committee was coordinated by FIDUCAL (Foundation for Scientific Research and University Development of Caldas) and was made up of by representatives of multiple entities such as several universities, CHEC (Hydroelectric of Caldas S.A.), the Committee of Coffee Growers of Caldas, the financial sector and community in general. The goal of the Regional Committee was mainly to articulate research activities, avoiding duplication of efforts. Some of the functions of this committee included the coordination of technical, logistical and financial support and the generation of the necessary policies needed for the implementation of volcanic seismic instrumentation, development of hazard maps and other research work. The Regional Committee obtained statutory recognition in August 1985 with the Decree 0977 of the State Government of Caldas. Parallel to the creation of the regional committee, a group of technicians gathered to form a Local Technical Committee in order to advise to the Mayor of Manizales directly. In the absence of a formal structure to deal with a situation without historical antecedents in Colombia, this Technical Committee was in charge of doing preliminary research, developing community awareness activities, providing assistance to authorities, and giving logistic support for national and international specialized missions, among other tasks. The Local Committee was formally established through Decree 079 signed by the Mayor in March 1985. It should be noted that this local committee was the first technical group in Colombia to formally include community awareness programs among its tasks. On September 11th, 1985 an eruption characterized by phreatic ash emission generated a small lahar in the Azufrado River and block falls up to 2 km from the crater. Subsequently, on September 17th, a delegation with representatives of the scientific community, the Civic Committee (with delegates from the CHEC, the Civic Corporation of Caldas and the Mayor of Manizales) and the Civil Defense, emphatically demanded from the Ministry of Mines a timely response from the State, warning about the imminent hazard and possible direct consequences of the progress of NRV symptoms (Hall 1990, p. 108; INGEOMINAS 2006, p. 35; Presidency of the Republic of Colombia 1986, p. 46). As a result, the Ministry created a national committee for the scientific investigation of the phenomenon. This national committee was composed of two bodies, the Sub-Committee of Volcanic Monitoring, with geophysics and geochemistry tasks, and the Sub-Committee of the Volcanic Hazards Map, coordinated by INGEOMINAS. The national committee was supported by foreign scientists, in addition to professors and geology students of the University of Caldas. By that time, due to the lack of solid technical information regarding the possibility of the eruption, the local and national media conducted multiple reports, some of them with partial or confusing information, contributing to confusion and fear in the population of the region, especially in Manizales (Parra and Cepeda 1990; Villegas 2003; INGEOMINAS 2006). Regarding the communication activities, the first formal attempt to divulge the scientific findings was during the public “Seminar on Volcanic and Seismic Risks Related to NVR”, organized by the National University and CHEC on March 26th 1985. During the seminar, members of the regional Committee coordinated by FIDUCAL presented the findings to the local community, since the main goal of the seminar was to “involve the community” in all the activities and decisions regarding NRV (INGEOMINAS 2006, p. 33). On September 19th, the Sub-Committee of Volcanic Hazards Map initiated the development of the “Preliminary Map of Potential Volcanic Risk of Nevado del Ruiz Volcano”. The 1:100,000 map was finished in on October 7 and contained the “delimitation of potential areas subjected to different risks from volcanic eruptions” (INGEOMINAS 2006, p. 39). The map was delivered to national, regional and local government and Civil Defense authorities and it was published in the national, regional and local press (Hall 1990). Between October 15th and 20th, 1985, several members of local emergency committees from multiple municipalities, including Armero, received technical advice from representatives of INGEOMINAS, SENA (National Learning Service) and the Institute of Territorial Credit—INSCREDIAL. These institutions developed a massive plan to disseminate the preliminary map of potential volcanic risks of the NRV. In addition to delivering to the population at the hazard zone an illustrative brochure developed by SENA, the representatives gave 87 lectures and open forums on risk prevention to the communities that could be affected in case of a volcanic eruption (INGEOMINAS 2006, p. 59). According to Omar Gomez (verbal communication), Head of Civil Defence at that time, the estimated attendance of this lectures and forums was around 5000 people. During October, volcanic monitoring continued and scientific delegates gave several lectures in Pereira, Armenia and Manizales to support the organization of Emergency Committees and to improve their knowledge on volcanic phenomena and community preparedness for volcanic disasters (the Presidency of the Republic of Colombia 1986). Despite the efforts of the scientific community to have a highly accurate volcanic hazards map and disseminate the scientific findings, on 13 November 1985 a small-magnitude eruption of the Nevado del Ruiz Volcano caused lahars that led to the death of about 25,000 people, mainly in Armero and Chichiná municipalities. It is important to highlight that in Armero, even though the lahars claimed the lives of 22,000 people, about 8000 survived. Many of these survivors evacuated to the nearby hills, previously identified as meeting points. Unfortunately, there are no records of how many people evacuated thanks to the information campaigns developed before the eruption. In 1985 the Colombian population had no knowledge about previous volcanic disasters and thus there was no experience in risk communication. In consequence, despite the efforts of the scientific community to create risk awareness, the reaction was not effective. After the 1985 eruption of NRV, there have been varying scenarios in the activity of several volcanoes in Colombia. This variation ranges from mild seismic activity, to eruptive states of different intensity. Consequently, several risk communication activities have been developed, as demonstrated below. The Nevado del Huila Volcanic Complex (NHVC) commonly known as the Nevado del Huila Volcano, is part of the National Natural Park Nevado del Huila Volcano located between the states of Cauca, Huila and Tolima. It is an active volcanic complex formed by stratovolcanoes and several domes whose maximum height is 5364 m. Its activity has been dominantly effusive, but in most recent development, it has generated pyroclastic flows produced by collapse and/or explosion of domes (INGEOMINAS 1996, p. 16). In August 1986 the first evaluation of volcanic hazards of NHVC (Cepeda et al. 1986) included in its results a high risk factor for lahars in areas around Páez River. The recommendations of that work included the promotion of: “permanent school education campaigns about volcanic and other natural phenomena that can affect the population, such as earthquakes, floods, landslides, etc.” (Cepeda et al. 1986, p. 83). However, at that time no education campaigns were properly conducted. The only activities in this respect were some lectures given to local authorities and community members in the urban area of Belalcázar municipality and the villages of Wila, Tóez and Ireland. These villages were later greatly affected by flooding and debris associated with the 1994 earthquake and the 2008 lahars. On June 6th 1994 an earthquake of magnitude 6.8 Mw caused many landslides and consequent flooding of the Paez River, causing more than 1000 deaths. After this disaster, INGEOMINAS (1996) published a second version of the volcanic hazards map. This map included an area of pyroclastic falls and debris avalanches near the crater. The final recommendation of this document was: “the most important measure required is to disseminate the knowledge contained in this report among authorities and inhabitants of the Paez River Basin” (INGEOMINAS 1996, p. 33). On 19 February and 18 April 2007 and 20 November 2008, the first historically recorded eruptions in the NHVC occurred. There eruptions significantly affected the social fabric and infrastructure in seven municipalities of the states of Cauca and Huila. Afterwards, INGEOMINAS sent to the affected area technicians with broad knowledge of the geology and the hazard of the Nevado del Huila Volcano. These technicians, even if lacking social-science preparation or training, had an extensive experience delivering technical information to potentially affected populations. An intensive communication campaign was then developed between March 6th and 13th of 2007 addressing about 1000 people from the local community, local emergency committees, students and teachers of the largest school (Escuela Normal) and indigenous governors from the Association of Indigenous Councils Juan Tama and Nasa Çxhã çxha (Fig. 2). Additionally, other lectures were given to Hospital personnel, the NGO Nasa Çxhã çxha and relief organizations like the Red Cross and Civil Defense. Finally, the INGEOMINAS personnel participated in a radio broadcast on the ‘community radio station Eucha’ whose motto is: “If I understand, I am understood”, with simultaneous translation from Spanish to Nasa language, spoken by the indigenous communities of the area. During the meeting with indigenous governors, a community participant stated that to the indigenous community the volcano was not a threat but a God. Given this fact, the intuitive response of the INGEOMINAS technician who sought an explanation, adapted to the indigenous world-view, was that the God was angry. He explained that if that God was really angry it was equivalent to what technicians call high activity, if the God was more or less angry it would be medium activity and if the God was only little angry it would be low activity and so on. Eventually, if the God gets very angry there could be damage to the high hazard zone. This explanation was welcomed by the indigenous community since it helped them to understand the technical jargon regarding alert levels. It is important to highlight the work of the Secretariat of Government and the indigenous community of the region in identifying evacuation routes and developing their own map of risk scenarios, for which they had the important support from the Association of Nasa Councils Çxhãçxha and the OSSO Corporation (Fig. 3). INGEOMINAS also supported the verification of the identified evacuation routes prepared by local authorities and the community (Fig. 4) and suggested extending such routes so the most vulnerable people were able to evacuate in time of emergency. As a result, community and local authorities extended the routes contributing to subsequent successful evacuation. According to Agudelo et al. (2012), from the moment the Volcanological and Seismological Observatory of Popayán (OVSPo), belonging to INGEOMINAS, reported the increment of activity of the volcano, the local community became aware and participated actively in the preparedness exercises and the monitoring of the volcanic phenomenon. Communities contributed with the worldview of the indigenous communities and their experience of what happened as a result of the 1994 Páez earthquake, thus strengthening the understanding of volcanic phenomena and their response capacity. With additional support from INGEOMINAS Manizales, the OVSPo continue working with CLOPAD’S, CREPAD’S (today municipal and departmental Risk Management Councils—CMGRD) and communities in urban and rural areas. This work focused on developing contingency plans and providing training in the volcanic area, with the aim of establishing early warning systems for volcanic risk. Additionally, the OVSPo provided broad and public information on the evolution of the phenomenon through official statements addressed to local and traditional authorities in the area of influence of the volcano, among other joint strategies designed together with the local operational Relief Corps and the community to promote timely and safe evacuation responses (Agudelo et al. 2012). Besides INGEOMINAS, many organisations participated in the exercise, including the Association of Nasa Çxhãçxha Councils, the OSSO Corporation and the National System for Disaster Prevention and Response (SNPAD), among many others. These organisations contributed to a comprehensive strategic planning exercise for the construction of an Early Warning System—EWS, involving the community in a daily prevention exercise, where each protagonist had a defined role to play in the process, from dialogue and conflict resolution, involving the whole community to reconstruction of the past, definition of the present and planning for the future by the whole community (Peralta 2008). On 18 April 2007 a lahar that reached speeds close to 80 km/h and average heights up to 13 m, caused damage to the road infrastructure in the area and destroyed six bridges restricting the access to the municipalities of Páez and Belalcázar, whose urban area was also strongly affected (Agudelo et al. 2012). More than 5000 people in the lowlands along the river Páez and Simbola areas, were effectively evacuated to the safe areas in a very short time (about 15 min). The success of the awareness and preparation activities was achieved for several reasons (Hall 1990; Semana 2008; Efe and Reuters 2008), including the articulated inter-agency work that started after the 2007 reactivation. Another reason was the constant monitoring of permanently available information through online seismograph in the institutional website. In addition, a local newspaper “The Swarm” published regular reports about the volcanic activity. Finally, the constant concern and interest of the community in understanding the volcanic phenomenon and make it part of everyday life contributed greatly to the timely and efficient response. The risk communication process developed on the NHVC is an excellent example of the high effectiveness of long term multi-agency, interdisciplinary and participatory work. This is evidenced in the big difference between what happened in the 1994 Páez Earthquake when 1100 lives were lost, and the evacuation in April 2007 and November 2008 when there were “only” 10 deaths (El Tiempo 2008), even though the 2008 event was more intense than the one of 1994 (Fig. 5). The Cumbal Volcanic Complex—CVC is composed of two active volcanoes: Cumbal and Mundo Nuevo. Its frequent hazards are mainly lava flows, ash and debris flows, plus hidroclastic and pyroclastic falls and lahars (Monsalve and Méndez 1988). The lava flows covers a 3.5 km radius from the crater and the hazard by pyroclastic flows goes up to 10 km radius from the crater. From February 1988 on there were a series of reports from the inhabitants of the Cumbal municipality, concerning changes in the normal activity of the Volcán Cumbal, such as noise and changes in the fumaroles. For this reason, the authorities of the state of Nariño requested that the Government draw up a map showing the vulnerable sites in case of a possible volcanic eruption (Monsalve and Méndez 1988), since they feared a similar tragedy to the one in Armero in 1985. The result was the Preliminary Map of Potential Volcanic Hazard Complex Cumbal (Monsalve and Méndez 1988) in which it was shown that the population of Cumbal is located close to the pyroclastic flows hazard zone. During the development of the hazard map two technical talks were given to the community of two villages in rural Cumbal to explain the mapping process. Later, during a fieldwork session, locals reacted aggressively and forced the withdrawal of the SGC personnel, claiming that scientists were “perverting the volcano” and stealing from it (sampling). What is more, the community did not believe that the volcano was under study, and insisted that mining practices were being carried out instead, which they deduced from the name of the institution: INGEOMINAS (National Institute of Mining Geological Research). This, coupled with the armed conflict in the area, led to the interruption of the field work. Fortunately this did not stop the completion of the hazard map and its technical report finished by the end of 1988. Soon after the hazard map was finished, three talks were given to the community and local authorities of Cumbal and two talks were given to the regional authority in Pasto. Over the next 25 years, permanent volcanic telemetric monitoring continued and the volcano did not show any significant changes in activity, until 2011 when the associated seismic activity increased significantly. As a result, the Colombian Geological Survey—SGC, began a process of updating the hazard map. Activities for updating the hazard map include field work and communication activities to inform the community about the work performed by the SGC. Even though the updated map was about to be completed at the time of preparation of this chapter, it is important to note that great difficulty has been encountered in developing both communication activities talks and fieldwork, as the community, mostly indigenous, has repeatedly rejected the work regarding volcanic phenomena of the SGC, claiming that the SGC works constantly for the multinational mining companies (which is emphatically rejected by local communities). The SGC repeatedly tried to talk to the Community Action Council, but failed because of constant evasive tactics. There were even threats made to the SGC technicians, which claimed that SGC was entering by force (despite constant attempts to disseminate the scientific information and to explain to the community that the scientific work regarding volcanic phenomena was completely unrelated to mining practices). To resolve conflicts with the community, the SGC has requested the support of local, regional and national authorities, who have been taking action, although, without significant results up to now. SGC issued on its website weekly bulletins that described the changes in the volcanic activity of the Cumbal Volcanic Complex, as well as the description of communication activities undertaken with communities and authorities. Prominent among these bulletins was the report of an institutional meeting held on 27 March 2014, between the SGC and the Ministry of the Interior called in order to analyse the situation regarding compliance of SGC missionary activity in CVC area, since SGC had not been able to enter the top of the volcano for almost a year because of opposition from some indigenous communities), (Boletín semanal de actividad del Complejo Volcánico Cumbal—Weekly Bulletin Cumbal activity Volcanic Complex 1 April 2014). Later, with the support of the Bureau of Indian Rom and Minorities Affairs of the Ministry of the Interior, between 4 and 6 August 2014, meetings were arranged with indigenous authorities and community members of the Indigenous Cumbal Reserve. The meetings, addressing the problem of admission to the upper Cumbal volcano, established some short-term strategies to move forward in this complex situation (Boletín semanal de actividad del Complejo Volcánico Cumbal, 12 August 2014). Currently, fluctuations in seismic activity continue as well as gas emissions. The SGC continues with the agenda of proposed activities with the support of the Bureau of Indian Rom and Minorities Affairs and the participation of indigenous communities and members of the Indigenous Reserve Cumbal (Boletín semanal de actividad del Complejo Volcánico Cumbal, 30 September 2014). The Cerro Machin Volcano is a highly volatile tuff-ring active volcano, reaching a Volcanic Explosive Index—VEI 5 with eruptions dominantly magmatic with highly destructive pyroclastic surges, whose deposits are distributed mainly in about a 12 km radius of the crater (Cepeda et al. 1996). A group of scientists from INGEOMINAS initiated the study of the Machin volcano in 1988 led by geologist Luis Armando Murcia (RIP). Following the death by natural causes of Murcia, the study of the volcano was temporarily stopped because the information gathered was partially lost. In 1995 work on the volcano resumed and the results were compiled in an internal document describing the volcanic deposits and different scenarios of volcanic activity, without a hazard analysis (Cepeda et al. 1996). Among its conclusions this document recommends “to disseminate the study results among government authorities, planners, investors and the general public, using methodologies of formal and non-formal education, with emphasis on disaster prevention and knowledge of the physical environment” (Cepeda et al. 1996, p. 45). Despite this recommendation, initiatives to disseminate volcanic risk information were not immediately undertaken. In 1999 the hazard assessment of the Cerro Machin volcano began and some informative talks were given to advise the community and local authorities about the conducted scientific work. As a result, some relief agencies carried on dissemination activities such as the one shown in Fig. 6, in addition to handing out over a few days, flyers at tollbooths to inform tourists that they were entering into an active volcanic area. The results of the studies initiated in 1999 were compiled into a document and a hazard map (Méndez et al. 2002). The document states that the volcano had produced six eruptive periods during the Holocene (four Plinian episodes and two dome collapses), the last one about 800 years ago. It has also produced domes, eruption columns of over 20 km above the crater, pyroclastic flows and surges and large volumes of lahar deposits, (corresponding to debris and hyperconcentrated dacitic flows that cover an area of around 1000 km2 to the East, in the valley of the Magdalena River). Currently, nearly one million people live in the area of influence of past eruptions where strategic plans for the national economy are being developed. The area also includes a key viaduct for 50% of domestic and international trade and for the communication between the central and southwest part of the country, including some coffee regions. The main vulnerable population centres are Ibagué, Armenia, Girardot, Calarcá, Cajamarca, Espinal, Flanders and Guamo (Méndez et al. 2002). It is important to clarify that the resulting hazard map does not present hazard levels, but represents the different volcanic products expected in areas of influence. As a result, in 2004, after the formalization of the document, multiple communication activities began in the area of influence. Since then there have been more than 1000 lectures on Cerro Machin addressed to the exposed population, relief agencies, student community and local, regional and national authorities (Fig. 7). The talks given by the SGC were completely technical and included the location and characteristics of the volcano, an account of historical eruptions, with comparison to similar eruptions, for example Pinatubo in Philippines. Among the experiences of volcanic communication there are a couple of interesting anecdotes. On Friday 28 December 2007 at 7:30 pm, a large earthquakes swarm associated with the volcano occurred. A strong earthquake was felt in the cities of Ibagué, Armenia and Pereira, more than 60 km away from the volcano. Following the instructions of the National Risk Management System, the emergency alarm protocol was activated, which is to alert system members about the variation of the volcanic activity so it would not take them unaware in case of a more significant change. The event coincided with Christmas celebrations, the Innocents Day and the taking of office of a new local Mayor (public officials had finished their contract that day at 6 pm). Because of this situation, many members of the emergency phone teams relinquished their responsibilities and passed them on to the next in the emergency phone chain claiming they thought the call was a joke, that they were celebrating, or just that it was not his/her responsibility. Another anecdote worthy of mention is that on November 8th and 9th, 2008 when a large swarm of earthquakes, including two earthquakes of magnitude 4.6 activated again the emergency phone chain. When calling the people located on the volcano, they reported that the earthquake had created panic in the Machin community, so they asked the SGC if it was necessary to evacuate. The SGC representative responded that he could not give the evacuation order, since it was the responsibility of the Local and Regional Committees for Risk Management (which SGC subsequently called). The community decided not to wait and started the evacuation to Ibague, even before receiving the official order, showing high risk awareness. Parallel to this, heavy rains generated large landslides blocking the roads to Ibague and Armenia, forcing people on the road, mostly tourists, to go to the town of Cajamarca. Tourists felt seismic activity and when asked what was happening, the local community, informed them of the existence of an active volcano nearby, (without further explanation), causing panic among tourists who had no idea of what was happening. Currently, the only information on the Machin volcano available for tourists, is a big public board next to the road to Cajamarca. 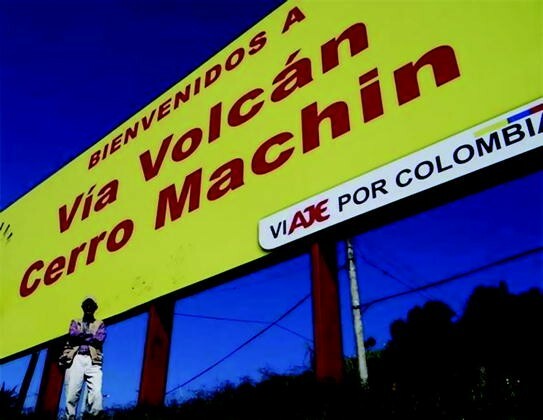 The board simply welcomes visitors to the Cerro Machín volcano (Fig. 8). Tourists and other itinerant populations are highly vulnerable during volcanic crisis due to their lack of hazard knowledge. Therefore communication about the specific volcanic hazard and risk to the travelling population is necessary as well as training of staff from tourist enterprises (so they coordinate an appropriate response in case of an event) (Bird et al. 2010). Regular and systematic documentation of both scientific, and communication activities is very important to ensure the generation of new knowledge, facilitate monitoring and reduce dependence on particular individuals, who may leave the process at any time. In this respect, no reports of risk communication campaigns by the SGC were made in the past because there was no awareness of its importance. The systematization of communicational experiences began only after 2004 as a result of the implementation in SGC of quality certification and corresponding ISO standard, which requires generating indicators of planned and executed activities on a regular basis. Today the SGC publishes on its website quarterly reports with results of the monitoring and volcanic hazard assessment, as well as the description of the developed communication activities. In recent history, Colombia has experienced different volcanic crises with great social and economic impact, from fatal eruptions, to activity changes without reaching eruptive consequences. Volcanological institutions and scientific organizations in Colombia have consistently reiterated the need for communication activities on volcanic hazards and risks. However, on several occasions the local authorities have chosen not to support the communication. In the opportunities where there has been inter-agency support, such communication activities have generated positive results. Technicians display great technical knowledge about eruption mechanism. Hence, they are important in the process of risk communication. The recommendation is to work together with social scientists, incorporating in the communication activities elements of the social science and techniques of public management to ensure that the message is understood and generates a consequent and timely reaction. A solid social science research program is necessary in order to get a better understanding of not only the impact of the communication of technical information in emergency management and risk reduction, but also to help SGC technicians and local authorities to understand the social processes that influence the decision-making of the public. Additionally, it is relevant to include an analysis of not only the volcanic hazard, but also the different components of vulnerability. Multidisciplinary approaches that combine natural and social sciences could help address complex elements such as uncertainty and trust-building, as well as to understand what makes the authorities and the local community to react in volcanic crises. Constant feedback and monitoring are critical to improve any communicational processes. Therefore, it is essential to evaluate the cases when the community and local authorities have not supported the hazard and risk communication processes, and also to generate instruments to understand the impact and effectiveness of the communication activities. In addition, any communication and monitoring strategy should always respectfully incorporate the knowledge of communities and local and regional institutions. The previous steps favour trust building between different stakeholders, influencing key elements such as risk perception, effective communication and community reactions to government mandates. In the risk reduction process, it is also very important to include the media from the outset, as well as having non-linear communication protocols to ensure that the message reaches all potentially affected people, even if one link in the communication chain fails. Regional cultural differences regarding land appropriation have an impact on the way people react. While North of Cauca ownership is low because the territory was occupied by people descended from other regions (as around Cerro Machín and NRV), ownership in the South is much higher due to traditional cultural attachment of several generations living in the area, as for example around NHVC. This favours or hinders the response to a volcanic alarm. Mining is an economic activity of high social impact in Colombia. In some regions of the country, local communities associate the volcanic research with mining activity, (which is translated into strong opposition and fieldwork obstruction, thus affecting the studies of hazard and risk). Except for isolated conditions, the community tends to trust in the technical work of the scientific volcanic community of Colombia, particularly, in the scientific information provided by the SGC. However, an assessment of whether such information is understood and assimilated by the population has not been made, and therefore both positive and negative aspects on the likelihood of this information to promote effective response during volcanic crisis is unknown. Furthermore, assessment of the perceptions and knowledge of SGC technicians and main political authorities regarding the relevance of public involvement in risk management has not been carried out. The Colombian Geological Survey—SGC, is a purely technical body, so its communicational work is limited to the transmission of technical knowledge about volcanic hazards. It would therefore be desirable to combine efforts with organisations or individuals in the social area to help assure responsiveness and understanding of scientific results by the communities and local authorities, in order to achieve the objectives of volcanic risk communication, which include both education and the promotion of risk reduction. A better understanding by geo-scientists and authorities of the social processes that influence the decision-making of the public is also necessary. The above can be achieved through feedback and simulations subsequent to the communication activities. These activities could be coordinated by the local committees of risk management with support of social scientists and should promote significant participation by the communities, as it was achieved in the successful case surrounding the eruption of the Nevado del Huila Volcano in 2008 described above. Volcanic risk reduction is not responsibility of one single person or institution but of everyone, including volcanological observatories, technicians, social scientists, academics, politicians, planners, disaster relief agencies, communicators, and of course, the community (Duque 2005). This requires constant, clear, effective and organized communication.